The Pagan Otherworlds Tarot comes in a linen white bag with the name Uusi in black Celtic lettering. The real packaging is inside that bag: a gorgeous blue and golden carton box with the logo of the deck. 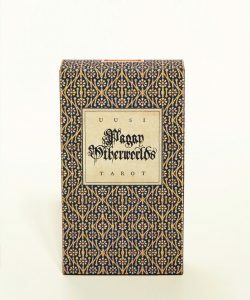 The design of the packaging is very elegant -dark royal blue with little light blue flowers and golden vines. It is closed with a cigar box-style red sticker. : pretty allover. While the box is beautiful, it is a regular tuck box. I guess, with the overall refined feel of this deck I would’ve expected (and especially liked) to see a sturdier box for storage. What about those “I have waited for this deck for a year so they better have awesome tarot art”-cards themselves? Those cards are slightly larger than the average tarot, in both length and height. (Medieval Scapini comes close, Tabula Mundi is wider). The backs of the card have the same gorgeous pattern as the box and readers who do reversals will be happy campers. 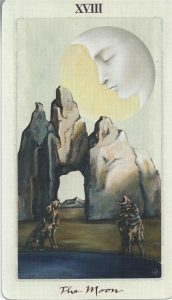 The stock quality of the Pagan Otherworlds Tarot is excellent. It’s thick enough to be sturdy, but flexible. No gloss and very smooth to the touch. Whichever way you shuffle, it will feel great. The deck itself… Oh boy! I think if I stopped writing and just showed you a bunch of pictures, it would be fine. Then again, sometimes you need to read the gushing to make sure your eyes aren’t fooling you. 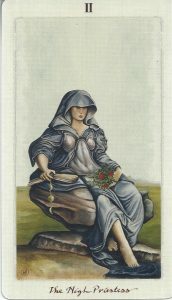 The Pagan Otherworlds Tarot is everything I expected it to be and more. In my hands, I have 78 many oil paintings (and the bonus Seeker + 5 Moon cards). For real! That’s how they feel, that’s how they look. The print job on this deck is amazing. It’s like you can see the canvas of the painter. The cards are printed on of white linen stock. The titles and Roman numerals seem to have been written with dark brown fountain pen ink or even with a quill. 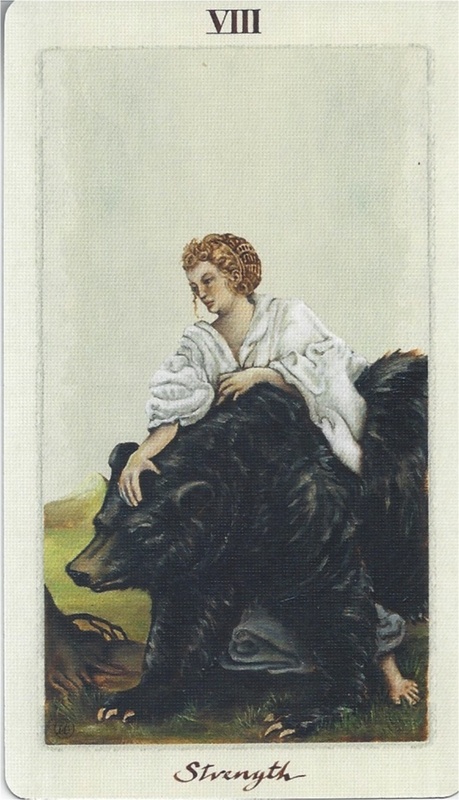 The Pagan Otherworlds Tarot does have a border, which usually means a big fat no in my book. In this case there’s no obtrusiveness about it. It’s the same white as the card stock and fits with the ‘painting feeling’. Besides, they are used for numbering and names. I think this has got to be one of the most elegant decks I have ever seen. 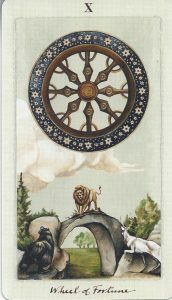 The Eight of Pentacles is divine, the Wheel of Fortune amazing and I can go on and on and on. The Pagan Otherworlds follows its own course when it comes to a system. You can see both WCS influences as well as more traditional (older Italian) decks. According to the design team that’s exactly what they wanted to show. 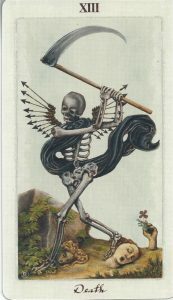 “When we were working on this tarot our thoughts were of all the symbols and narratives found in the Rider Waite Smith deck as well as older decks before it filled with ancient, folkloric archetypes that gave guidance to and framed the questions we’ve asked of this object for centuries. We wanted to continue that conversation, explore their contents and search for the essential qualities in them that spoke to this time that we inhabit,” so said Linnea & Peter of Uusi when asked. When working on the review for this deck I looked into a couple of cards specifically and landed into an IG-discussion on the Swan on the 9S. I asked Peter and Linnea about the artist’s intent behind the use of this symbolism. We wanted to continue that conversation (..) at a time when our history and discourse with this planet and each other has never been more essential. It sounds grandiose, but this dialogue and search felt like a natural extension of ourselves – one that each of us is made for – and that the universe wants to hear. 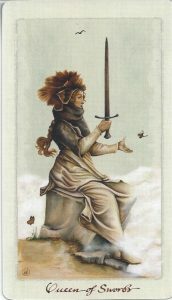 Interestingly enough, the 9 of Swords is where this powerful connection originates. 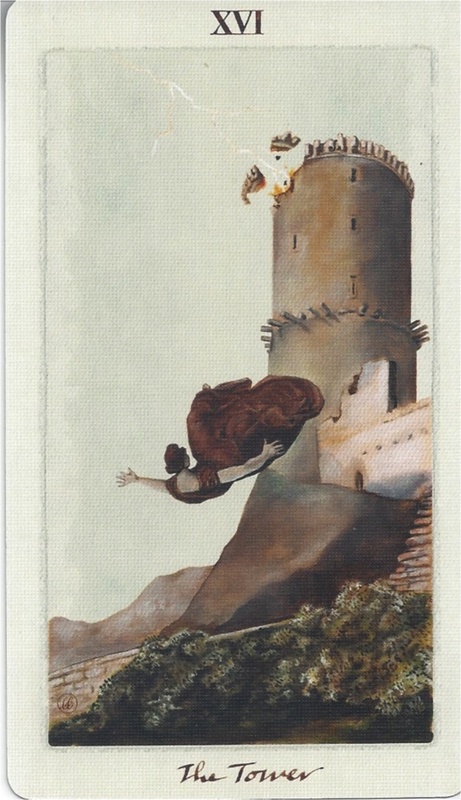 It is a card that deals with the subconscious and dreams. This is the card that floats down the ladders of our DNA ,searching for our most essential selves. It unmasks us there and jolts us out of our old way of seeing. It is the card of transformation and it has a sense of destiny about it. We have no control over the moment of its arrival and when it appears we will be changed like the duckling that grows into a swan. But this transformation comes at a price that each of us must contend with. 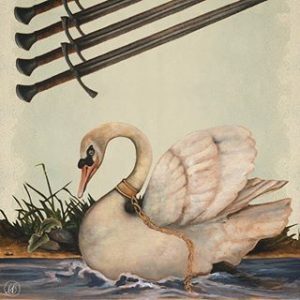 That little gold chain attached to the swan’s neck that falls down into the water disappearing under the buoyant’s gliding form is the reminder that though we are born with this magical gift of transformation it does not release us from our past. There is a great responsibility to remember where you came from to learn what your future can be. 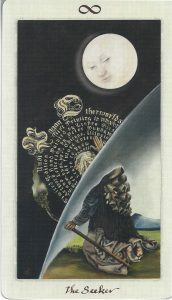 The minors make sure the Pagan Otherworlds Tarot could be called a pip deck, with a pattern that is reminiscent of say an Italian Tarocchi (many embellishments). However there are also elements that could be called scenic, but not in the way you are used to from the WCS. For example: in the Four of Wands you can spot a castle in the background, the Three of Pentacles is centered around a rock formation, the Five of Pentacles has a snowy landscape and the Six of Cups shows a cottage and a goat. So, elements of the Waite Smith minors have been extracted as stand-alones and then included in the Pagan Otherworlds Tarot. And sometimes there’s no link to the WCS at all and you’re looking at something new. For less advanced readers in pip-decks the minor elements could be used as some form of mind map. For those who think that scenics are too limiting: nowhere here are they designed in such a way that they create those ‘one meaning cards’. On the contrary, there’s a lot of free flow possible here. It is like the Uusi-designers picked the elements they liked from a Soprafino, a Waite-Smith and perhaps aTarot the Marseille here and there. Then they adapted and poured them in to this work of art – adding new symbols in the process. It is absolutely otherworldly, no doubt about it. However, there is a slight disappointment with one card in specific. With everything so well adapted and changed into this new pattern and deck style there is one card that breaks that pattern. And I would be very sorry if readers who don’t like the WCS for exactly those cards would walk away because of this one. I am talking about the Three of Swords, showing a heart with three swords piercing it. Sounds familiar? Yes, it is an exact replica of Pamela’s card. I don’t really understand why. The rest of the minors are so nuanced and new. They are the creative result of a marriage between traditional decks and winks to the scenics of the Waite-Smith. 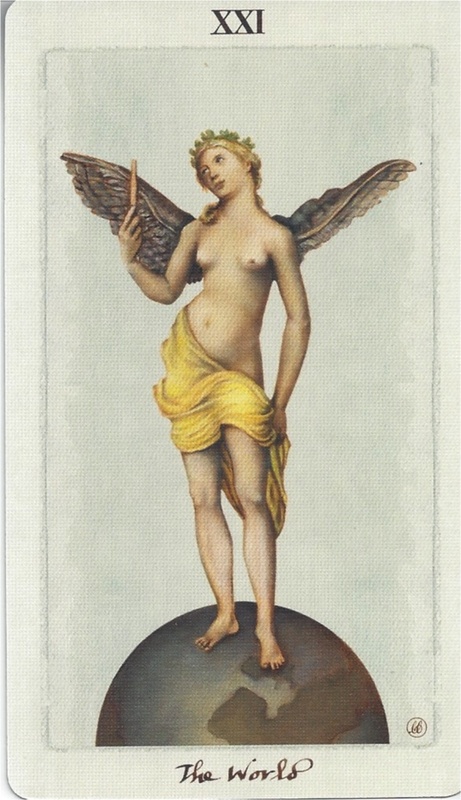 This 3S could be a nod to history – since Pixie ‘took’ her 3S most likely from the 15th century Sola-Busca Tarot – it still does not fit this new style they came up with. Since I am complaining ;-), I think it is also wise to say that the Pagan Otherworlds has no little white booklet or downloadable version. There is a companion book, but you have to buy it separately (by the time I am writing this review it is sold out). I can’t tell you if it is any good or useful since I don’t have it. But I would have loved to see some basic info on the moon cards and their view on the used symbolism, coming with the deck. In the table you can see the information Uusi sent me after I requested some on the 9S. If that text is similar to the companion it would be very interesting to have. 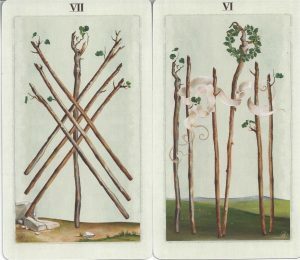 Despite the name of the deck, the Pagan Otherworlds Tarot isn’t ‘obvious’ Pagan. The ‘woodsy’ clothing of the characters and those five extra cards with moon phases are the only thing springing to mind. 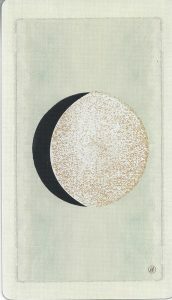 Talking about the moon cards…One of the hardest things in tarot could be made much easier by using these gold flecked cards: foretelling time. The moon can give you pretty accurate ideas on the ‘when’ of your outcomes. Now that I’ve basically told you everything about deck and (lack of) book it’s time to see how this beauty reads. There’s no book and the deck is a bit of a hybrid tarot, so in my opinion that means you’re completely free in how to read the Pagan Otherworlds Tarot. I for one would not simply copy/paste Waite-Smith meanings onto the deck, or any other deck for that matter. There’s too much room for other things to pop up while you’re reading. That swan in the 9S is a good example, but there are so many other variations in how swords and wands are positioned. 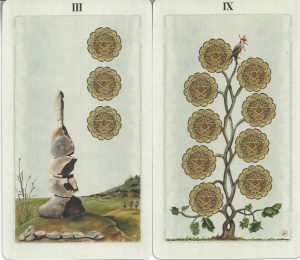 The fact some have leaves intertwining or growing, other cards are ‘helped’ by buildings, rocks and the animal kingdom. It’s very suitable for ‘open reading’; where do the King’s eyes go, where is that bird or butterfly flying to. It is an ideal deck to ‘jump into’. 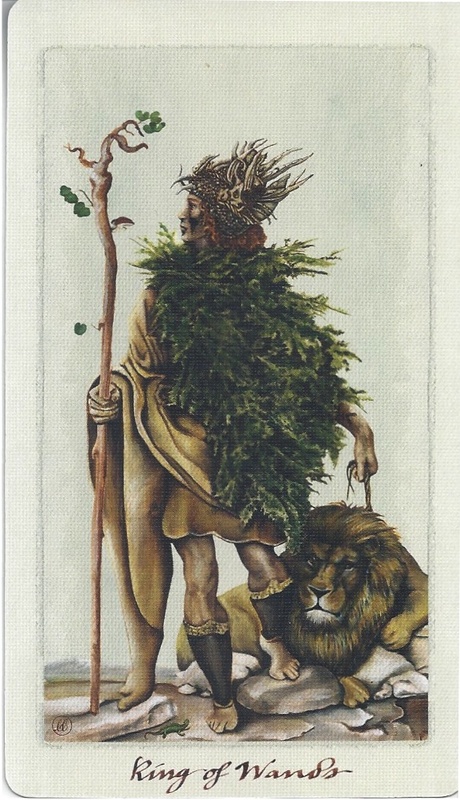 Complete novices would do well to have a basic understanding of either traditional or WCS tarot. Other than that I think everyone with a basic knowledge of suit-symbols, some well-known tarot symbolism and elements can let their mind wander and have excellent tarot readings with the Pagan Otherworlds Tarot. The little deck interview with the Pagan Otherworlds on what to expect, is interesting. 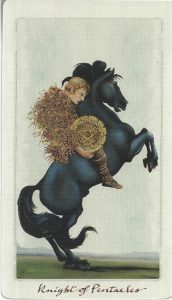 Queen of Pentacles, King of Swords, Tower and Strength. 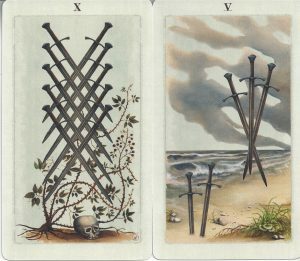 The King of Swords might be the master of mind, but he’s focused on the Queen and the rose she seems to withhold from him. While first flipping through the deck its beauty will stand out, but don’t let that overwhelm you. Both the Queen and King parts tell you this deck has everything to offer on both parts: the luscious and elegant art, but also the many pointers for your brain to work with. You could be shaking in your tarot boots in the beginning, since this hybrid has changed the rules. Don’t worry: it’ll be a gracious fall and straight into the arms of the part of you that can handle any deck. Because, when it comes down to it: it is just combining what you know & think and let the intuition do the rest. 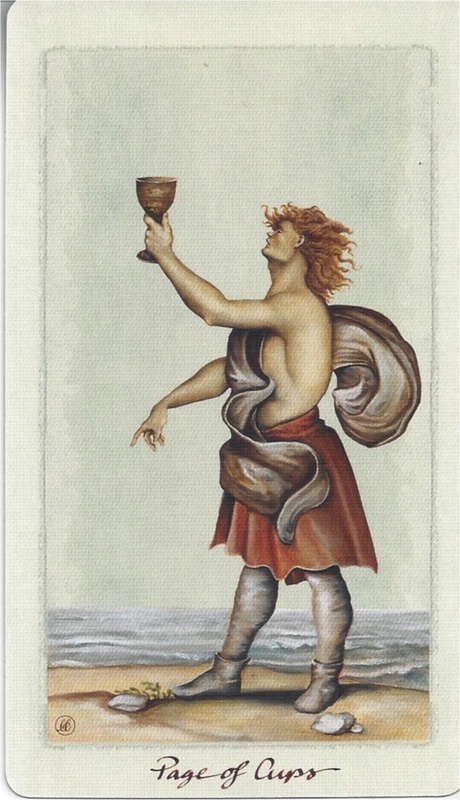 Pagan Otherworlds Tarot bonus card, The Seeker. 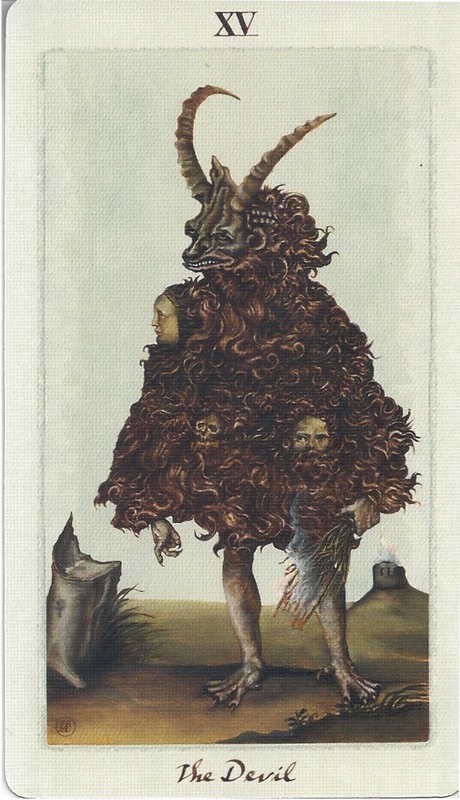 To sum it all up: the Pagan Otherworlds Tarot is without a doubt one of the most beautiful decks I have ever seen. 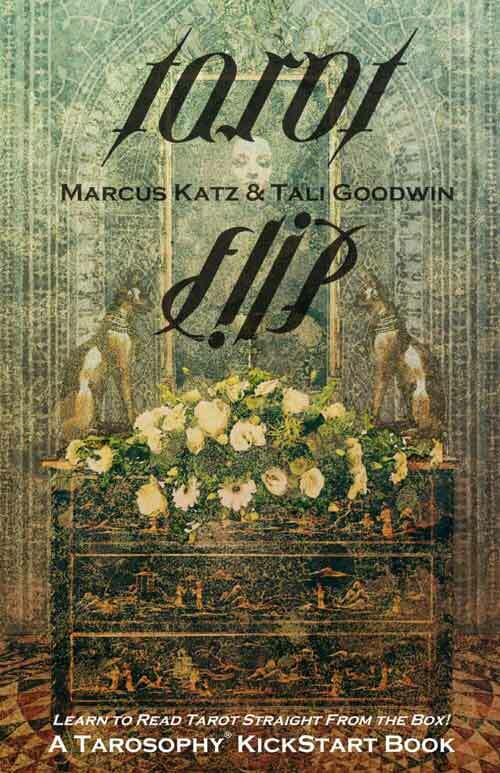 It is ticking most boxes of what we are all looking for in a deck: great art, elegance, an original twist, quality stock and a relatively easy read due to its symbolism -despite some unexpected surprises. My guess is, that it’ll be a pretty straightforward tarot deck for the average reader. I also think the Pagan Otherworlds can be of interest to both TdM/Italian deck readers and those focused on WCS-inspired art. This deck is a hybrid of the best kind, a happy marriage exactly because it gives a reader space in how to work with it. It already made it into my actual go-to pile, and that is no mean feat.